CCPPO (Cumulative, Convertible, Participating, Preferred-dividend Ordinary) shares are the type of equity common (also known as ordinary shares) shares issued by a company that contains multiple features, including cumulative dividendsCumulative DividendA cumulative dividend is a required fixed distribution made to shareholders regardless of company profitability. Preferred shares are the most common type, participation feature, convertibility into common shares feature, and preferred-dividend feature. Essentially, CCPPO shares represent a combination of common and preferred sharesPreferred SharesPreferred shares (preferred stock, preference shares) are the class of stock ownership in a corporation that has a priority claim on the company’s assets over common stock shares. The shares are more senior than common stock but are more junior relative to debt, such as bonds.. In the event of bankruptcy, holders of CCPPO shares can make a priority claim on a company’s assets over common shareholders, but the shares are junior relative to preferred shares. Similarly, CCPPO holders are entitled to a priority claim on the company’s dividends relative to the common shareholders. CCPPO shares are a relatively rare type of equity securities. The shares are primarily issued by startups that are looking for initial financingFinancingFinancing refers to the methods and types of funding a business uses to sustain and grow its operations. It consists of debt and equity capital, which are used to carry out capital investments, make acquisitions, and generally support the business. or by companies that undergo turbulent times. CCPPO shares are attractive to potential investors since they include the features of preferred shares (preferred and cumulative dividends, convertibility into common shares while carrying voting rights). The combined features provide tighter control over a company (through voting rights) to the holders of CCPPO shares while the investment risk is reduced (due to the preferred claim on dividends). Private equity firmsTop 10 Private Equity FirmsWho are the top 10 private equity firms in the world? Our list of the top ten largest PE firms, sorted by total capital raised. Common strategies within P.E. include leveraged buyouts (LBO), venture capital, growth capital, distressed investments and mezzanine capital. and venture capitalists are the parties that are typically interested in obtaining CCPPO shares from companies. If a company misses some of its dividend payments to shareholders due to some reasons, the cumulative provision requires a company to settle all missed dividend payments to the shareholders whose shares include the provision. The cumulative dividend feature ensures that the holders of CCPPO shares will receive all the dividend payments that they are entitled to. The convertibility provision provides a right to a shareholder to exchange his/her preferred shares into common shares at a predetermined exchange rate. Similar to preferred shares, CCPPO shares contain a provision that allows exchanging the shares for common shares at a predetermined rate. The participation feature provides the holders of CCPPO shares an opportunity to receive dividend payments above the normally specified dividend rate. Unlike the holders of non-participating shares who are subject to a restriction on earnings distributed through dividends, the holders of participating shares can potentially receive earnings above their fixed rate. Participating shares also grant liquidation preferences to its holders over common shareholders in case of a company’s liquidation. Essentially, if a company is liquidated, the participating shareholders are entitled to receive back the purchase price of their shares, as well as any leftover value that would remain after the liquidation of a company as if the shares were common shares. Note that CCPPO shares are ordinary, not preferred shares. 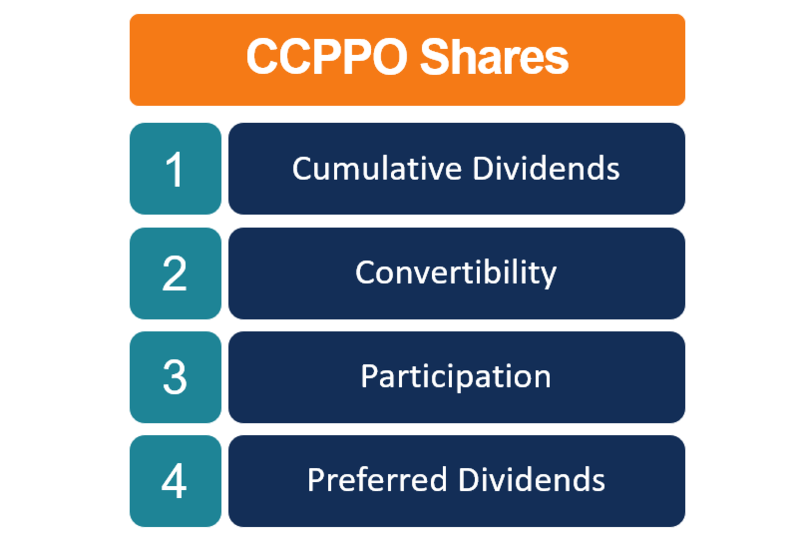 Since ordinary shares do not offer preferred dividends, such a feature is specified for CCPPO shares. The preferred-dividend provision determines a fixed dividend rate based on the stock’s par value at which dividend payments are paid. Note that the preferred dividends are generally higher than the dividends for the common shares. Marketable SecuritiesMarketable SecuritiesMarketable securities are unrestricted short-term financial instruments that are issued either for equity securities or for debt securities of a publicly listed company. The issuing company creates these instruments for the express purpose of raising funds to further finance business activities and expansion. Venture Capital InvestingVenture Capital InvestingVenture capital investing is a type of private equity investing that involves investment in a business that requires capital. The business often requires capital for initial setup (or expansion). Venture capital investing may be done at an even earlier stage known as the "idea phase".